Liven up scrambled eggs by adding a sprinkle of shredded cheese or fresh herbs. Make rich and creamy scrambled eggs by adding small cubes of cream cheese or a dollop of cottage cheese before cooking. Beat eggs, milk, salt and pepper in bowl until blended. Heat butter in large nonstick skillet over medium heat until hot. Pour in egg mixture. 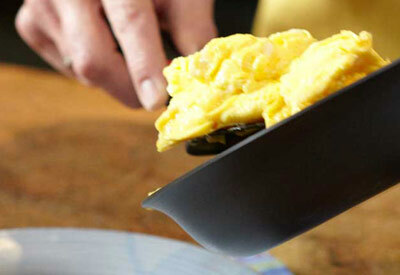 As eggs begin to set, Gently Pull the eggs across the pan with an inverted turner, forming large soft curds. Continue cooking - pulling, lifting and folding eggs - until thickened and no visible liquid egg remains. Do not stir constantly. Remove from heat. Serve immediately. Lighten up. Cooking spray and water can be substituted for butter and milk. Avoid cast iron. Eggs scrambled in a cast iron skillet can turn a greenish shade. This harmless but unappealing color change is the result of a chemical reaction between iron in the pan and sulfur in egg whites. Don't overcook. The heat retained in the pan will continue to cook and firm up the eggs after pan is removed from the heat. It's a matter of preference. Light beating produces more dense scrambled eggs. Vigorous beating aerates the eggs, resulting in lighter fluffier curds. It's best to serve scrambled eggs as soon as they are cooked, but if necessary, they can be held for a short time. Place the skillet of cooked eggs in a pan of hot water rather than over direct heat. Almond Breeze� Almondmilk Creamer is a delicious, dairy-free alternative for your morning coffee. Incredibly smooth and creamy, add our creamer to your cup of joe for extra flavor and delight! At only 10 (Original) or 15 (Vanilla) calories per serving, it's sure to become a family favorite.